Pyrenees Print Costume of a Man. 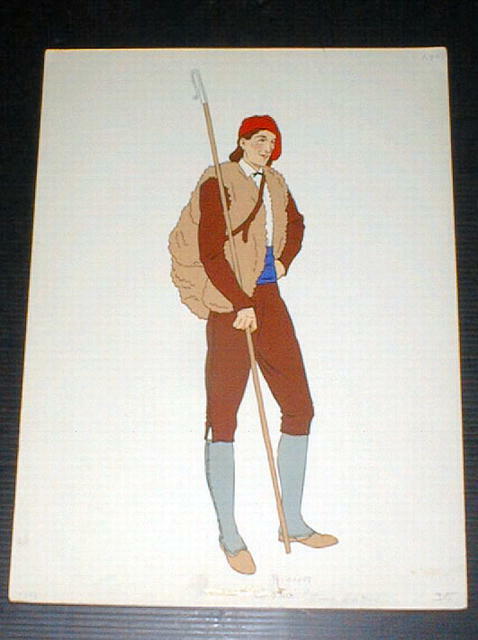 This is a print, in color, of what I believe to be a French Sheepherder. With the sheep's wool vest and carrying a staff. Burgundy trousers and jacket, gray leggings, red cap and tan vest.and shoes. A very nice print suitable for framing. In mint condition. Measures 9 1/2" by 12 1/2". This is of heavy paper from a portfolio of a costume maker from before 1900. We do not know the exact age. Items Similar To "Pyrenees Print Costume of a Man"